Hi, I am interested in your 1975 Mercedes-Benz 280S (stock #49C) listed on Autotrader for $7,995. I'd like to get more information about this vehicle and confirm its availability. 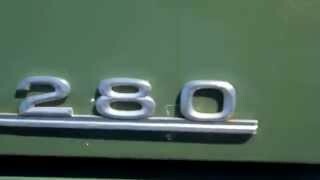 I have a beautiful Mercedes-Benz 280 with low mileage. I have taken this M-B in as a consignment vehicle and I hold clear title and power of attorney to sell it for my seller. The exterior paint is beautiful. Great shine and luster. There is No body dents or ding showing in the panels of this M-B. It is a 1975 and there is some sufrace rust that you expect from a Mercedes of this age. The interior is Tan leather in near pristine condition. The seating surfaces are perfect and the carpet shows to be perfect. It has a factory power sunroof and factory A/C that blows cold. It has the options that would be standard on all models of this vintage. It is a Model 114. The Alloy wheels are free from road rash and the tires are near new. We have preformed service on this M-B and replacement rear tail lamps were the problem. The right rear power window is not operational. There are no power door lock. We have inspected this vehicle for mechanical problem and We have repaired all issues or have service them. This is a great looking vehicle. I have personally driven this M-B 280 and it drives straight and responsive. We will offer our exclusive A-Len Limited warranty at no additional charge. Please visit our website at www.alenautosales.com to view more of our high quality pre-driven vehicles. Call 630-852-7821 if you would like speak to a live salesperson about any question or to schedule a test drive.